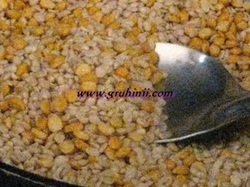 Roast chana dal and urad dal in thick bottomed pan in a medium flame, until they turn to golden color. (you can smell the aroma of the roasted dals) . Make it into fine powder in a mixie. 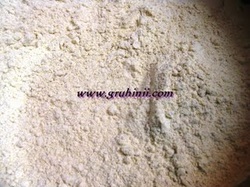 Sieve the powder and take it into a large bowl. Now add 4 cups of rice powder to it. Mix well. Heat a table spoon of ghee in a pan. Add it to the mixture. Mix well and add salt, red chilli powder, hing and carom seeds. Add sufficient water and make a thick but smooth dough. ​Take a frying pan and heat sufficient oil for deep fry. 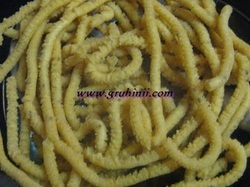 Place small balls of dough in a chakli mould and deep fry chaklis in oil until golden brown. 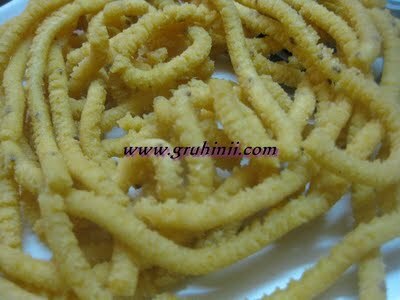 Tasty chaklis (muruku) with chana dal and urad dal are ready. Allow the chakli/murukku to cool and store in a air tight container.